Architectural Thinking for Innovation Challenges. From companies, urban networks or digital systems, there is a need to coordinate spaces and species - humans and non-humans-, technologies and emotions, ideas and budgets. Structured all of them in one remarkable project. There is a need to put in NEW COORDINATES the components of the future organizations. From the micro to macro scale, from institutions to cities. The potential of building THE ARCHITECTURE OF A SYSTEM, from the strategy to the design and making process, is becoming a powerful value in a moment when almost everything has to be build in a new way. At FJORD, as Design Director, I am leading the projects where the DIGITAL interacts with the PHYSICAL creating some new experiences and new spaces: from our homes to our cities, from the way we work to the way we learn or shop (workplace, retail, education spaces...). You can see developed some of these issues on Fjord Trends 2019. The fantastic challenge of being the Director of IED Innovation Lab has been the best opportunity of shaping an organization from multiple dimensions. 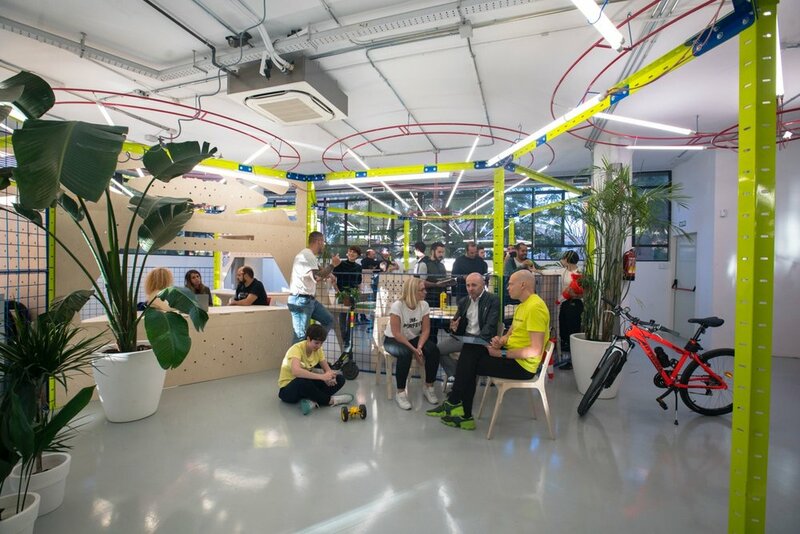 All of its components - the space, the team, the identity and the labs in the fields of Technology, Environment, Service Design and Business - were conceived to embody the concept of a design playground for transformation projects. It responses to what an innovation company should be nowadays: a mix of a consultancy, prototyping and learning centre. The space design has been awarded by tech media Fast Company and the New York Times Style Magazine as the best workplace design and widely published on media. We inhabit a reality where the physical and the digital define in a exponentially blended way the user´s experiences. At Mi5VR we focused on the potential of approaching the digital design from a spatial point of view. Recent technologies like Virtual, Augmented or Mixed Reality have an evident necessity of it. But not only the immersive experiences can be improved from an architectural point of view, currently from some digital platforms are promoting a new type of domesticity related to our identity, privacy, experiences and connections. The ideation of the project My Cloud My Castle reflects about a new concept of home online. Article: Why the Next Design Frontiers will be in Virtual Spaces. A world in constant change requires a constant learning. Innovation implies learning. Teaching is the best way of learning. From the beginning, my relation with Academia has been quite committed. My position as a Unit Master at the most experimental and prestigious architectural institution, the Architectural Association in London has provided the best conditions to reflect not only about what is the potential of being an architect nowadays but as well to imagine what could be the future of the human environment. From a completely different side, applying architectural thinking to the Fashion Design education, opened a successful path to incorporate experimentation, conceptualization and critical thinking to that discipline in a completely different way. Designing buildings has been the traditional attribution of an architect. But an architectural project is much more than that. From Mi5 Architects, we built several public commissions from open international competitions. For example, the Youth Center in Rivas was the outcome of a participatory process with the future users. The project more than a building became the creation of an identity for the teenagers of a peripheral city. It could be said that a Phd. is the maximum expression of a research process: A five years work of investigation, interviews, reflection, reading and writing about a specific topic. Architects from the XIX Century not only designed the houses for their clients but as well the whole set of elements of their domestic space. This was not a control freak attitude but an intention to design a consistent experience. The architect of the past was the UX designers of the future. My doctoral thesis, Space Suits. Clothing as an Architectural Project, focused on that moment when architects designed dresses as part of the architectural commission: small and nomadic architectures to live in. From those ancient fabrics to the current technological wearables was the focus of this work. The most relevant components of the urban fabric are nowadays intangible networks. Invisible spatial geometries shaping the urban IOT, Big Data, Automatization and AI. From one side, a planetary engineer work is requiring a new contract among human, robototics, information and Nature. From another side, organization and companies are not still taking advantage of the huge potential of the urban scale within their strategic opportunities. From thinking buildings to building thinking. Co-Founder and Director of Mi5Architects and Mi5VR. NM has been teaching at IED Madrid - Fashion Design and Digital Arts and Experience Design - and Associate Professor at the UAH - Universidad de Alcala de Henares, Madrid. His work has been published, awarded and presented internationally.